(4" X 6.5") 40 pages. Nose to Nose is a collection of 52 haiku arranged in four sections. and in "After the Drowning" he attempts to reconcile human tragedy and death. 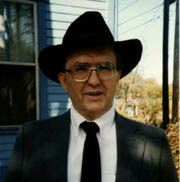 Gene Doty teaches writing and literature at the University of Missouri-Rolla. He has published haiku, tanka, ghazals and other poems in such places as The Rolling Coulter, Lynx, Frogpond, and Woodnotes in hardcopy and in Pogonip, Conspire, Thoth, and other zines on the World Wide Web. He is a poetry editor for the Web zine Recursive Angel. He has published critical essays on Russell Hoban, Stephen King, C.S. Lewis, and James Blish. As Eugene Warren, he published several collections of poetry, including Geometries of Light, Fishing at Easter, and Christographia. Married for 35 years, he has four children and seven grandchildren (his best work). He is a member of the Religious Society of Friends (Quakers). I was born on the western slope of Colorado, in a small town called Craig. I grew up on a farm in east central Kansas. There were a lot of ranches in that area, and we raised cattle as well as wheat, corn, alfalfa, and other crops. I grew up on horseback, learning to ride when I was four or five years old. I grew up with people who remembered the frontier in Kansas. These people included my adoptive father, who was born in frontier Kansas in 1889. As a boy in that country, I did such work as field hoeing, branding cattle, driving cattle to be shipped to market, castrating cattle and hogs, assisting in the births of calves and pigs, hauling hay, shoveling grain (wheat, oats, milo), grinding grain and hay for feed, mowing, raking, plowing, and combining. Weather hardly ever kept us from working, whether the temperature was 20 below zero or 100 above. Rosalee Bazil and I were married in January of 1963. We have four children and six grandchildren (as of Feb. 8. 1996). Being a grandfather satisfies me more than almost anything else that has happened. Rose and I belong to the Religious Society of Friends--specifically, we are members of the Rolla (Missouri) Preparatory Meeting, which is under the care of St. Louis Meeting. St. Louis Meeting is affiliated with Illinois Yearly Meeting and Friends General Conference. I am drawn to Friends because of the openness and emphasis on personal experience and responsibility. Combined with an accepting community, the testimony that "there is that of God in everyone" promises a place for growth and service. My birth name was Doty (my father was Floyd Doty). However, I grew up as Eugene Warren, not Gene Doty, after my mother's divorce and remarriage. Until 1988, my poetry and other writings were signed Eugene Warren. Much of my poetry deals with my life in Kansas. Some can be found in my book, Geometries of Light, published by Harold Shaw in 1981, with the name Eugene Warren. I changed my name from Eugene Warren to Gene Doty in August of 1988, reassuming the name I was given when I was born.